When the sun goes down, the fun continues at Trabolgan. Why not visit our ever popular Amusement Arcade where you’ll find some of the latest challenging arcade games along with favourites such as pool and air hockey. Our free nightly entertainment programme offers an exciting mix of shows and activities the whole family can enjoy. 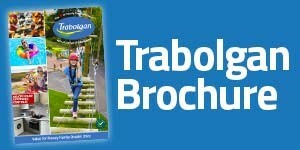 And if the kids are sleepy after a busy day at Trabolgan, why not take advantage of our babysitting service? Whatever you choose, Trabolgan has the right evening entertainments venue for you – The Cove, Cotters Bar or both!